You should probably know that I am an expert when it comes to coloring with Copic markers. At least that was my expectation when I got them for my birthday. Reality was far from that rosy dream. I'm used to using Zig markers and Distress Ink, but Copic markers work very differently. Instead of a wash of color the ink goes down with conviction. It definitely took some work for get any kind of blending. I ended up really loving the vivid colors. I'll list the colors I used in the materials section if you are interested. I've watched enough extremely talented people use Copics, and I went the the simplest coloring method. I started with the lightest color and added depth with a mid tone and darkest shades. This was all trickier than I expected, especially when my darkest blue pen began dripping blobs of ink. I've contacted the company, but as yet they have not understood me (language barrier). I emailed my third attempt at communicating yesterday. If I hear back, I'll update you. I had fun making contrasting dots and flicks of darker color. It wasn't perfect, but I was happy with my first attempt. Then I added little details with a white gel pen on the blue flowers. I'm going to be spending time coloring with these markers, I can tell. It reminds me of happy times coloring on those big doodle art posters when I was a kid. Once I colored all I dared on the Doodle Blossoms, there was nothing left to do but fussy cut out those flowers. Much trickier than my Tiny Tree Rings that I did weeks ago. I plopped on my bed, busted out some Netflix and cut. It's quite slow going when the movie gets riveting. I didn't cut a hole in my bedspread. Whew! 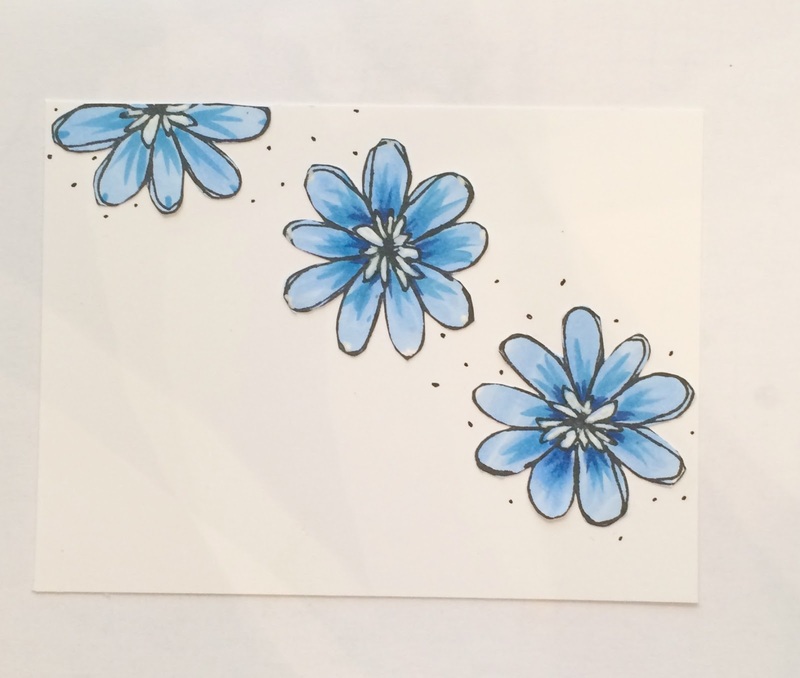 The blue blobs ruined one flower. I tried blending it out, but was not successful. I was able to use half the flower so that is just was I did. I had to pop those flowers up. They came up pretty well. One was a little creased. The card stock was finished--it had three big holes in it. Time for a fresh start. I let the yellow flowers come and play and at last I had something that worked. I kept the little black dots for movement using a Sharpie ball point pen. I love those pens. If I can't wait for my matt gel medium to try, they don't gum up. Almost fool proof. So what's the lesson to this story? If at first you don't succeed,...you must by crafting! Materials:Materials: All projects feature my products from Pink Bunkadoo or are affiliate links.